In what the Central Bank of Nigeria (CBN) described as steps to achieve its economic recovery plans and sanitization in the Nigeria money market, the apex bank announced the sack of 5 commercial banks CEOs and their executive directors. The CBN Governor, Sanusi Lamido reaffirmed this decisive decision in a news conference on Friday (14th August, 2009) that the managing directors and executive directors of Afribank plc, Intercontinental Bank plc, Union Bank plc, Oceanic Bank plc and Finbank plc were being sacked, pointing that the step was necessary to safeguard the Nigeria's financial sector from systemic collapse. Subsequently, the bank named new Chief Executive Officers for the five affected banks. Mr. Lai Alabi is to take over the affairs of Intercontinental Bank, while former Managing Director of EcoBank Nigeria, Mrs. Funke Osibodu has been appointed to head Union Bank. Mr. John Aboh who held sway briefly at WEMA Bank last year is now the acting Chief Executive of Oceanic Bank, Mr. Nebolisa Arah is for AfriBank and Mrs. Susan Eroche takes charge of FinBank, a bailout of 400 billion naira (2.55 billion dollars/ 1.8 billion euros) was however awarded to the affected institutions. According to the CBN boss: "These 5 institutions are in a grave situation and ...Their management has acted in a manner detrimental to the interest of their depositors and creditors''. He confirmed that the banks were heavily dependent on Nigeria Central Bank loans. Said he: "The total loan portfolio of these five banks was 2,801.92 billion naira (17.8 billion dollars/ 12.6 billion euros). Margin loans amounted to 456.28 billion naira and exposure to oil and gas loans amounted to 487.02 billion naira. Aggregate non-performing loans stood at 1,143 billion naira”. "As far as October last year, some of the banks showed serious liquidity strain and had to be given financial support by the Central Bank in the form of an 'Expanded Discount Window (EDW),'" he said. It was further revealed that when Lamido took charge of the central bank, the total amount outstanding at the EDWwas 257.571 billion naira (1.64 billion dollars/1.15 billion euros), most of which was owed by the five banks. Also outstanding balance on the EDW of the five banks amounted to 127.85 billion naira at the end of last month, representing 89.81 percent of the total industry loan to the CBN. Four of the banks were clearly unable to repay their obligations, while the fifth had been a very frequent borrower. 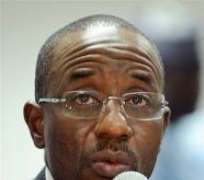 Liquidity ratios of the five banks ranged from 17.6 to 24 percent as at May while the regulatory minimum stood at 25 percent, said Sanusi, a former managing director of First Bank plc, one of the nation's three biggest banks. Following merger and recapitalization of banks, midwifed five years ago by the CBN, the nation's banks were reduced from more than 90 to only 25 solid banks. That figure later dropped to 24. However, there has been mixed reactions over CBN's latest decision; some stakeholders have described the development to be harsh and drastic, saying it is capable of destabilizing the Nigeria banking sector. While others lauded the initiative with the view that it will serve as deterrent to other banks, and further said it's a sign of sincerity of purpose on the part of Lamido who succeeded Soludo some couple of months back (June 4, 2009).